Since they work behind-the-scenes all year, we asked the Retro Planet staff to go through the online catalog and share what they want (or want to give) this Christmas. Writer Rebecca is cross between a comic book geek and retro enthusiast. Here’s what she’s begging Santa for this year. When I was little, our kitchen that was done in that shade of avocado green that was particular to the ’60s and ’70s. This clock is a bit mintier than I remember, but the second I saw it I was 5 again. 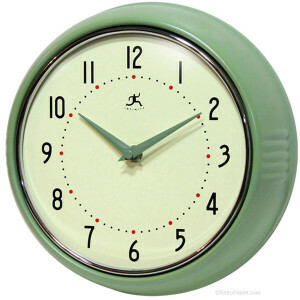 To me, this clock is cereal on Saturday mornings, Sunday breakfasts, and Thanksgiving dinners. Something about the color just sends me right back in time, and I’d love to add this piece to my current kitchen or even my bedroom. This is, hands down, my favorite sign at Retro Planet. There’s nothing like the look of a classic Dodge, and this sign has four of them. Plus, my favorite – the Charger – is front and center. Everyone who knows me well knows that my big dream is to own a ’68 Dodge Charger so this sign would make the perfect gift for me. I also love this sign because it’s not just a photo of a car or a logo on a plain background. 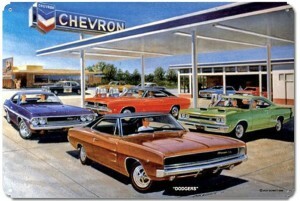 Instead, it looks like you’re peering through a window into the ’60s or ’70s. This sign is artistic, realistic, and unique and I would love to hang it in my home. Regardless of how carefully I put my earbuds in my bag at the end of the day, a portion of my morning is always spent untangling the mess they’ve somehow gotten themselves into overnight. My working theory is earbud gnomes, but I’ve yet to catch the little buggers in the act. 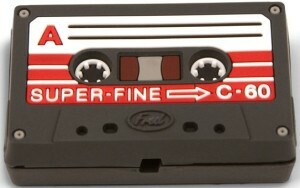 This would make a great stocking stuffer for me both because of its practicality and because it reminds me of all those mix tapes I made in the ’80s and ’90s. I love my iPod, but sometimes I sure miss those tapes so this spooler would give me the best of both worlds. This decal also has Thor vs. Galactus on the cover, which is pretty awesome in itself (c’mon, Galactus, Devourer of Worlds, vs. Thor Odinson of Asgard? How much more epic can it get?). The only thing I like more than geeky stuff is retro geeky stuff so this decal would make a perfect gift for me. I’m a big geek. Really. And my love of all things Avengers is all over my desk. So when I saw these I could barely contain my fangirlish glee. I know, they’re a pair of sunglasses. 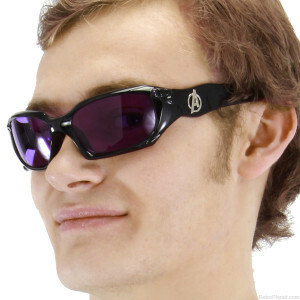 But they’re *Hawkeye’s* sunglasses! And they’re affordable! If you’re a geek like me, you know how much companies charge for prop replicas (lots). Not only are these glasses well within the stocking stuffer price range, I also wouldn’t be too terrified to wear them because I was afraid of damage (I can be kind of brutal on my glasses). 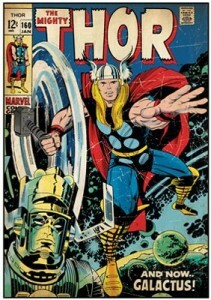 Plus, they even have the Avengers A logo on the side – how cool is that? I would love to find these in my stocking on Christmas morning. I hope Santa’s listening.